As you can see if you have been following the Ship Tracker website, we have been making our way back towards Pascagoula. We still have some stations to work, and won’t be reaching the dock until Friday morning, but we will continue to head in that direction. The weather has gotten a bit windier, with much larger swells over the last couple of days. 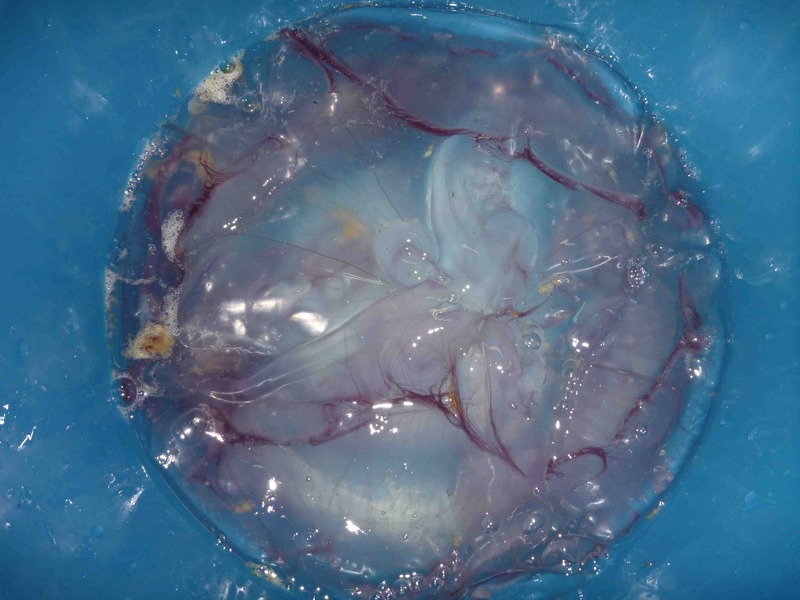 This has made collecting the plankton even more interesting. With the wind frequently above twenty knots, handling the equipment becomes much more dangerous. Some procedures need to be changed a bit for the sake of safety. 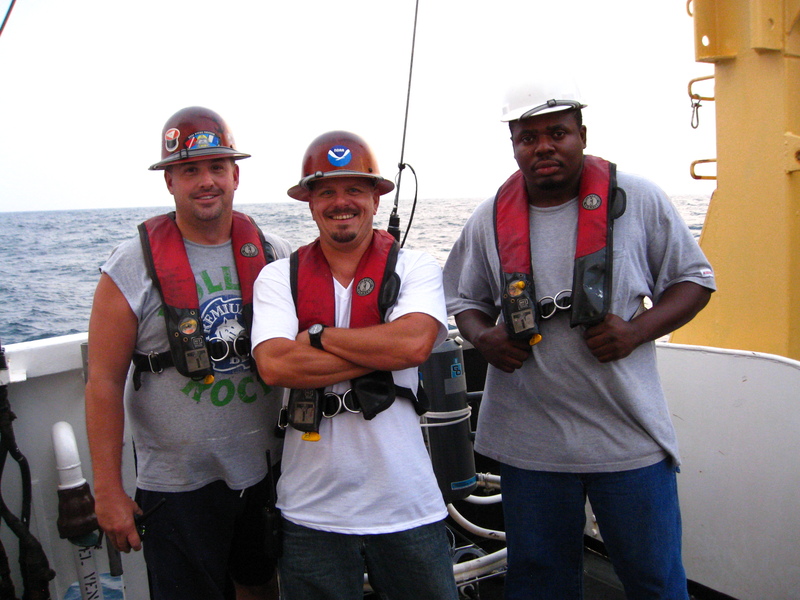 Luckily, the deck crew, Tim, James, and Chuck, are on top of things. They are pretty funny to work with, too! 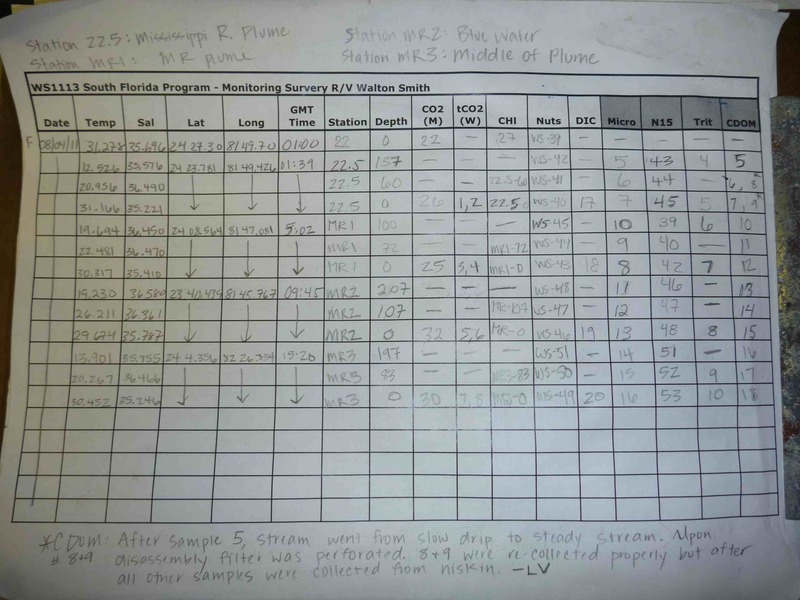 The plankton stations have continued, with the biggest changes being how much sargassum (seaweed) we have needed to rinse out and go through, and the different kinds of tiny animal life we have observed. 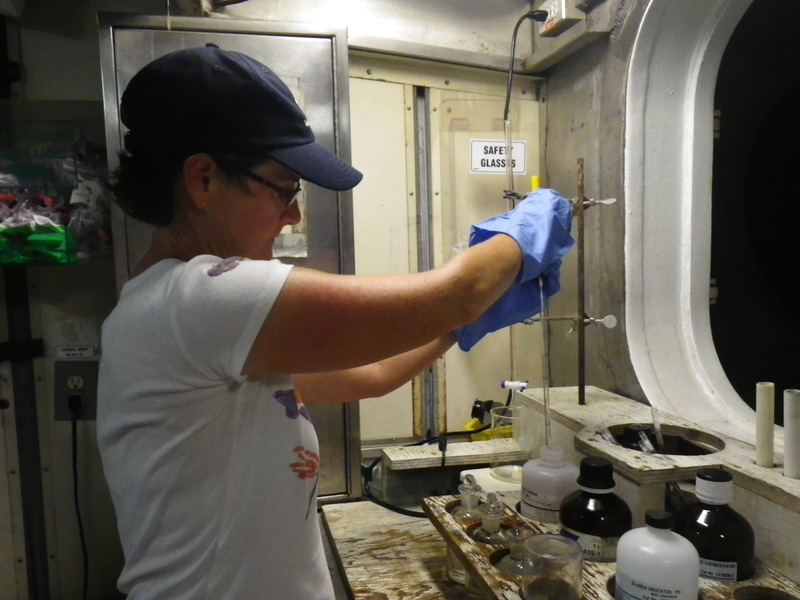 I mentioned in an earlier blog that the scientists must periodically do water titrations to verify that the readings taken from the CTD are correct and nothing is malfunctioning. I had an opportunity to perform some real chemistry as Kim Johnson, the chief scientist, walked me through the water titration steps. 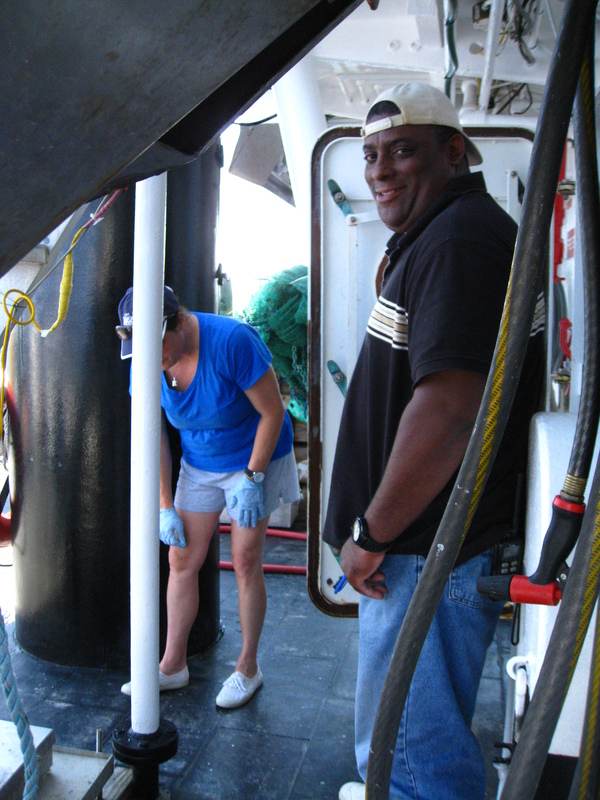 First we had to collect the water samples from the CTD. Remember, we are testing the oxygen levels, so it is important to collect the water samples without allowing bubbles to form, which might add oxygen to the sample. You would be surprised at how hard this is! A flexible tube is attached to one of the three Niskin Bottles on the CTD tank, and before any water is put into the jars, all of the air bubbles in the tube must be squeezed out. This is an art! Then the water can be transferred to the jars through the tube, holding the end of the tube against the side of the beaker to avoid making bubbles. The stoppers are then gently put into the glass jars, again to avoid the addition of oxygen to the samples. 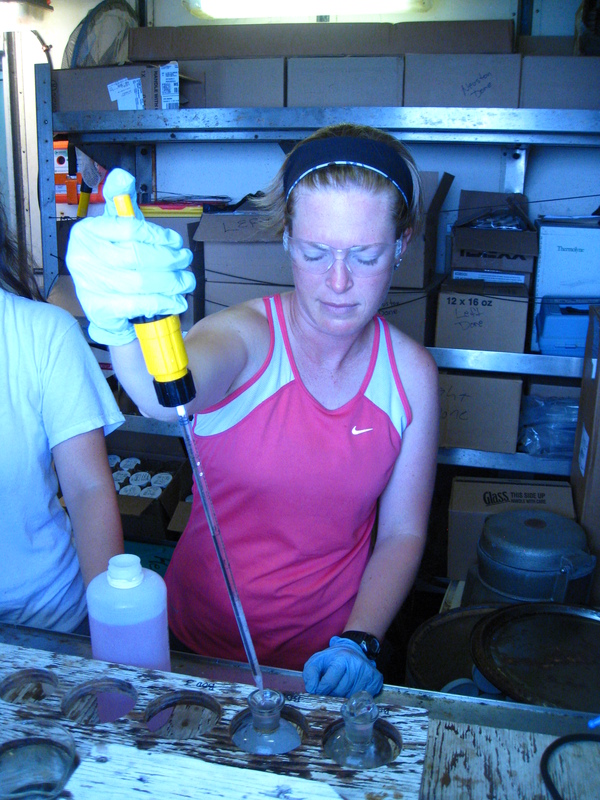 It is important to keep the water samples from getting too hot if you are not going to do the titrations right away. Can you think of why heat might create a problem when doing a titration? Also, we test three samples. Why do you think testing three beakers is important? Now we are ready to start the mad chemist part! The chemicals used, and their amounts, are very specific, and the directions are posted in the lab so that you can always check your memory. 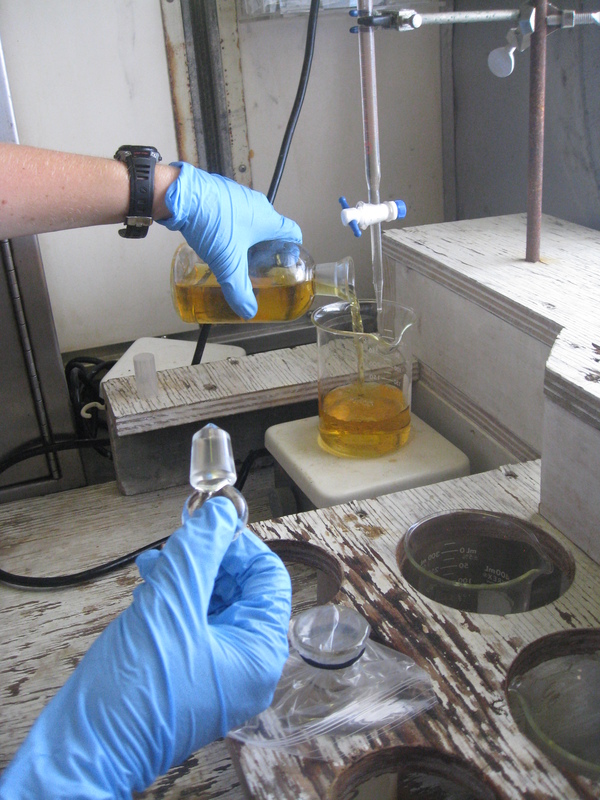 First, two milliliters of manganous sulfate is added to each sample. 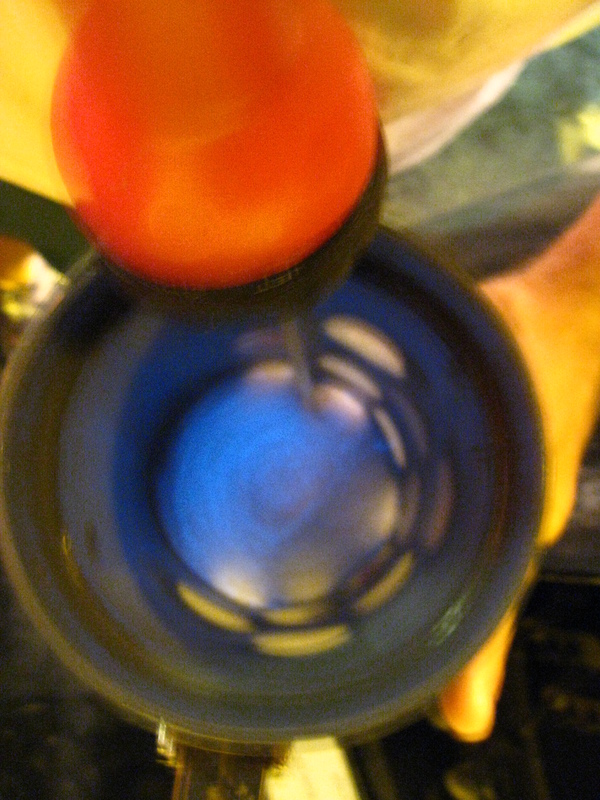 The stopper is replaced after adding each substance, and the jars are turned upside down and back several times to mix the solution. The second substance added is two milliliters of azide-iodide solution. After the solution is gently mixed, the jars need to stand for ten to twenty minutes. When you come back after twenty minutes, you will see that there is a cloudy substance in each jar. This first part of the process causes the chemical bond between the hydrogen and the oxygen to break, and the oxygen forms new bonds with the added chemicals. 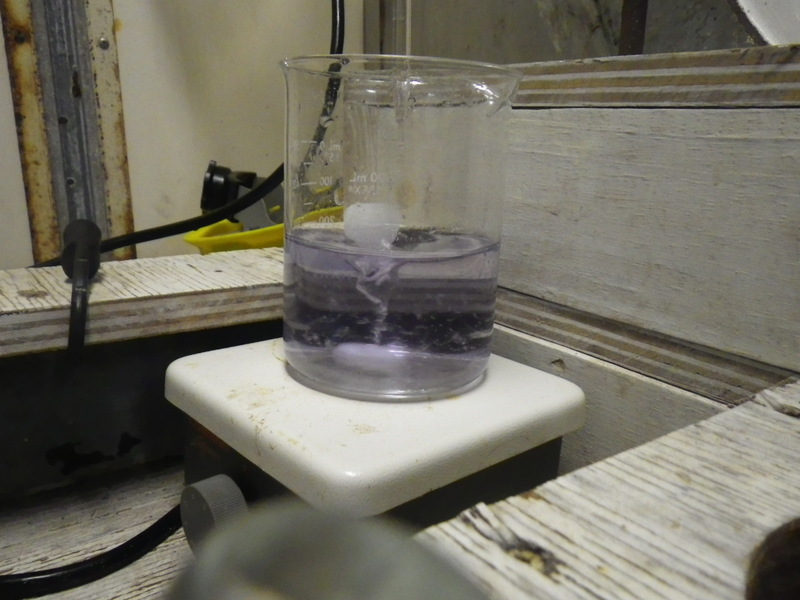 A cloudy substance forms after the manganous sulfate and azide-iodide are added and mixed. The sulfuric acid changes the color, and after mixing, causes the cloudiness to disappear. Now we have a yellowish liquid and I will be adding phenylarsine oxide, drop by drop. This is the titration part. When the color turns clear, we can look at how much phenylarsine oxide was needed and that will tell us how much dissolved oxygen was present in the sample. This new chemical will bond with the oxygen molecules and cause a color change. However, because the change from yellow is hard to see, I added one milliliter of a starch solution for the only purpose of turning the sample blue. This way the color change back to clear is easier to see. 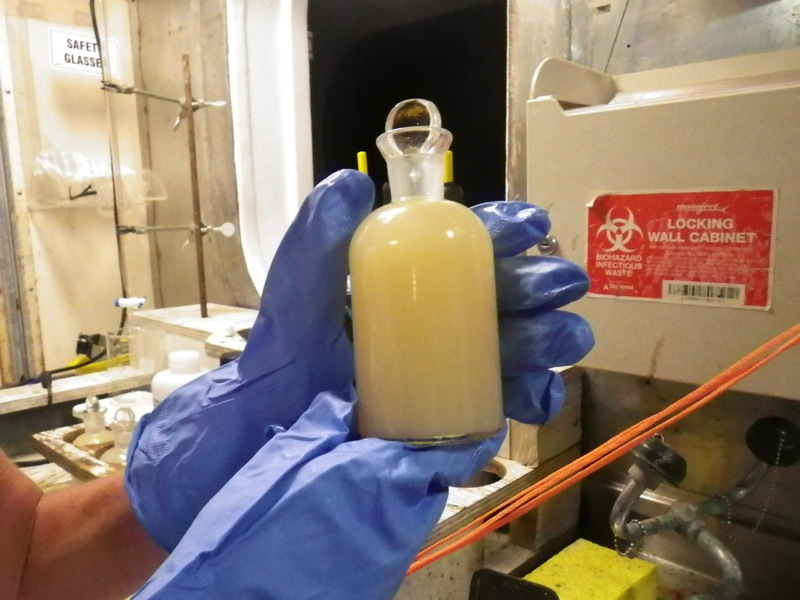 Notice the color change after the starch is added (the blue beaker). 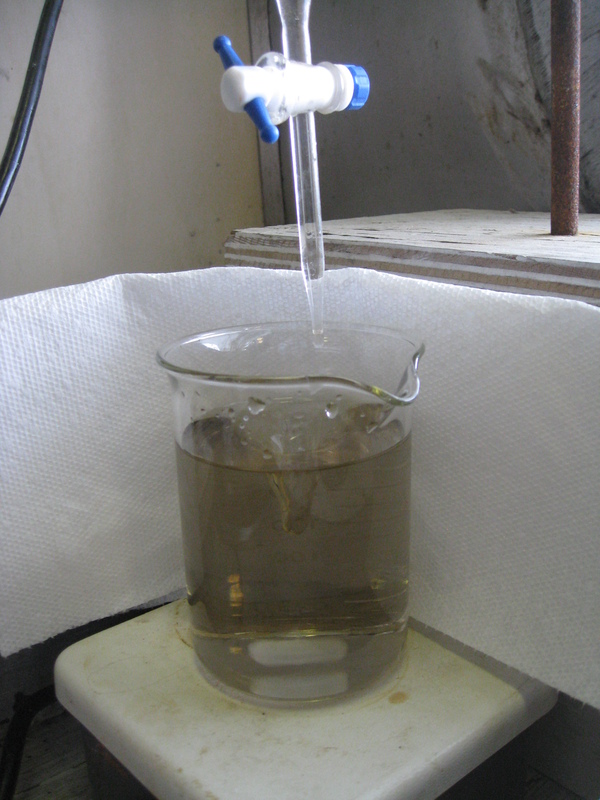 The sample is poured into a wide-mouthed beaker and a magnetic stirrer is added to the beaker. This is a small, magnetic bar that spins when it is on the metal stand. Drops of the phenylarsine oxide are allowed to slowly drip from a burette into the sample. A burette is a very tall, thin, glass pipe-like container that allows easy adjustment of the flow of liquid, and allows for easy reading of very small amounts. The burette is allowing the phenylarsine oxide to mix with the water solution, one drop at a time. Once the sample starts to lose its color, you know you are close. One or two more drops and you will shut the valve on the burette and read the amount that was mixed into the sample. Notice the color change towards the end of the titration. Once the color change is complete, the titration is finished, and the burette is read for the dissolved oxygen content. My samples showed dissolved oxygen amounts of 6.4, 6.5, and 6.5 milligrams per liter. 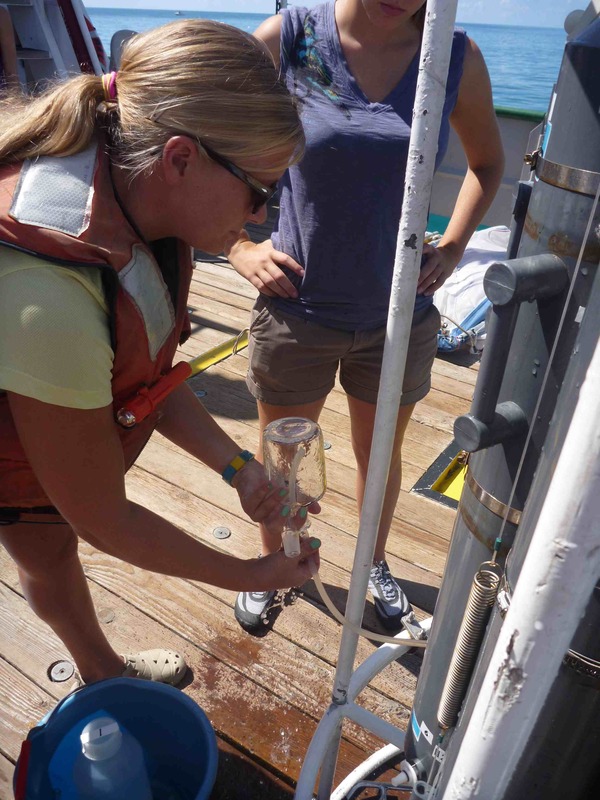 The CTD showed dissolved oxygen of 6.4 mg/l. Since our results were very close, we are confident that the CTD is working well. Remember, levels below 2% are considered hypoxic. 6.4% is a very healthy dissolved oxygen reading. This is what we expect as we move further from developed land, but it is still reassuring to see the healthy levels. Later I tried another titration without supervision and found consistent readings of 4.9 mg/ mg/l oxygen. However the CTD reading was 4.35 mg/l. I guess I need more practice! Yesterday we had the opportunity to participate in a buoy rescue mission. 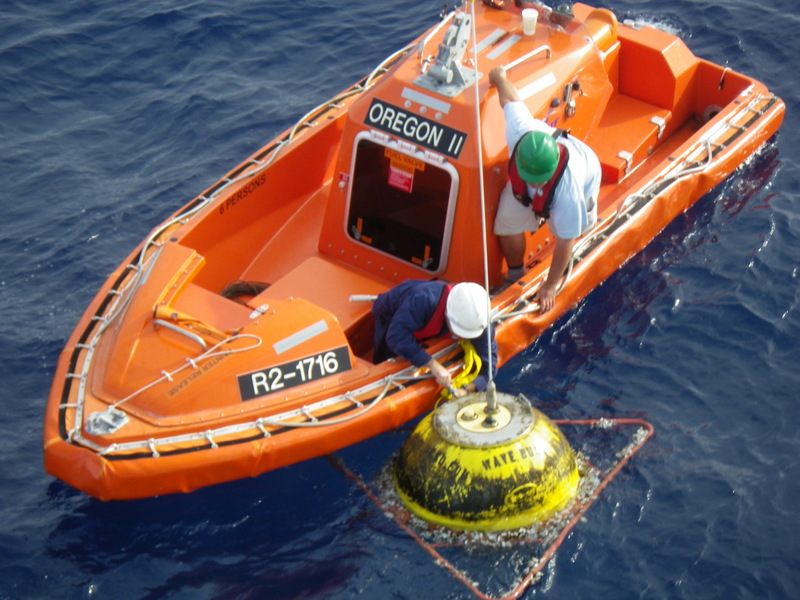 Another organization had deployed a wave buoy, or a wave runner, in the middle of the Gulf of Mexico that had been damaged, and was no longer able to give correct readings on things like current and wave height. We were in the area, and agreed to retrieve the buoy. As we got closer to the GPS signal, we spotted a large orange ball with an eight foot (about) antenna sticking out of it. Oregon II’s small motor boat was launched and we set about collecting the buoy. 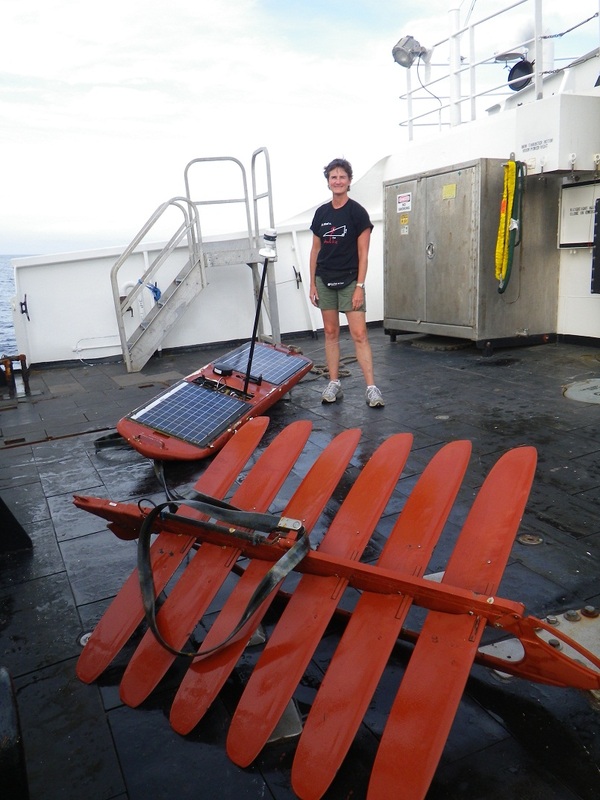 As we reached it, the deck crew and the CO noticed some things about the buoy that were inconsistent with the description. After making a telephone call, the CO told the crew to come back to the ship. We had come across the wrong buoy! Off we went in search of the correct one, which we found about half a mile away. This one looked more like a surfboard and was fairly easy to get aboard the ship, using the crane. That mission was accomplished, but we all marveled at the odds of finding two wave buoys within half a mile of each other in the middle of the Gulf of Mexico! Using the crane to lift the wave runner onto the deck. The part of the wave runner that looks like a surfboard sits on top of the water and has solar panels. It is attached to the slatted part that acts as a glider, and uses wave energy as it rises and falls to propel the board through the water. 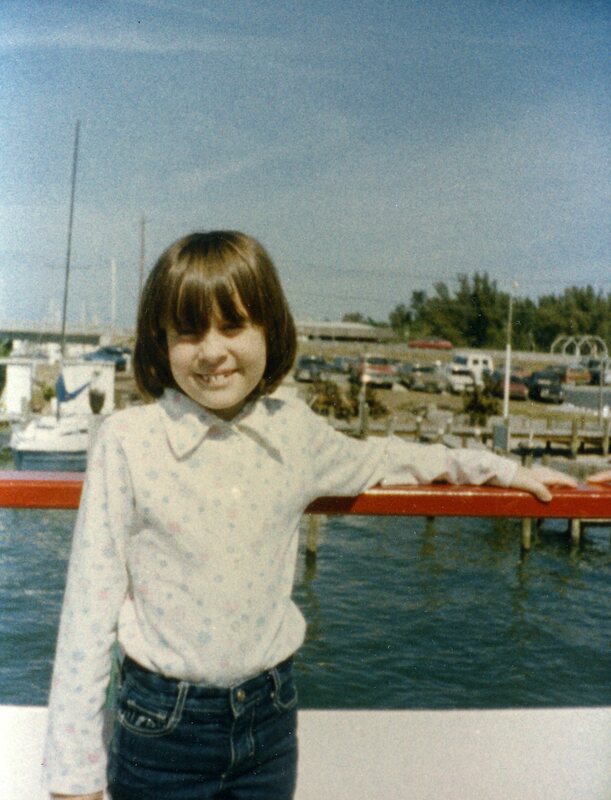 While I am still enjoying the cruise and the work, I have had a few days of queasiness. Taking the seasick medicine helps a lot, so I am sticking with that for a few days. Nights have been fine, and the rocking of the ship really is like being rocked in a cradle. I hope I’ll be able to sleep when I am in a stationary bed back home! Being on a cruise on a small ship brings me back to my days of living in a college dormitory. You are living in very close quarters, eating every meal together, spending large amounts of time together, and really getting to know the people who are on your watch. I have had a great group to work with – people with a lot of knowledge, and great senses of humor! 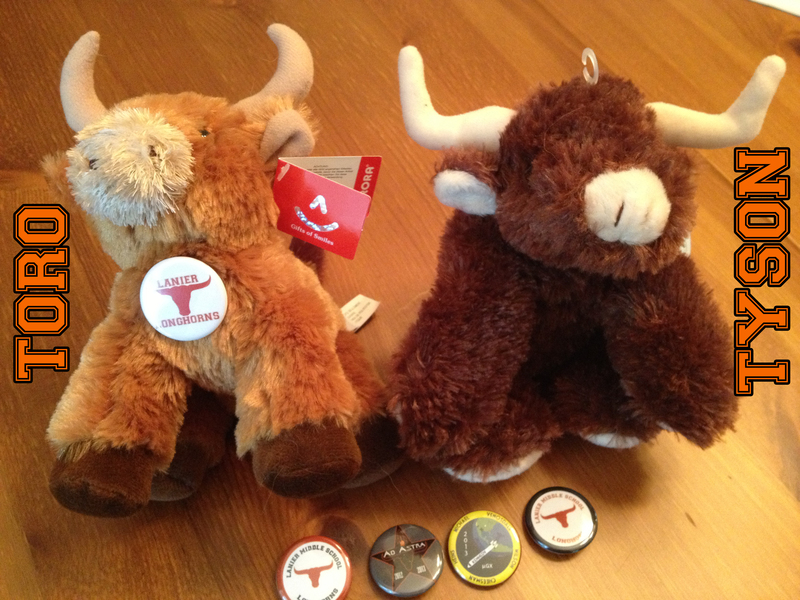 Victoria, a college intern, has been a newbie with me. We have learned a lot from the other scientists, Andre and Joey, on our watch, as well as from our chief scientist, Kimberley Johnson. 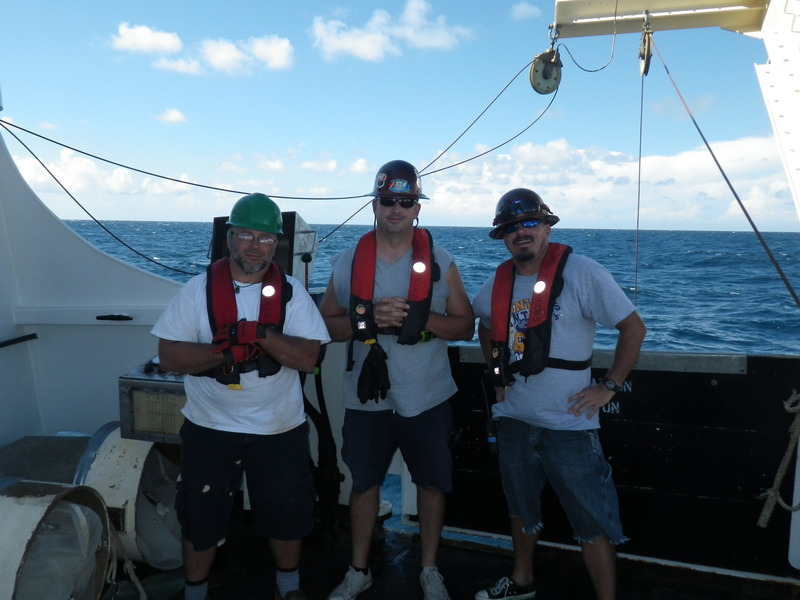 Tim, James, and Chuck are the deckhands on our watch, and they do most of the heavy work, like lifting the equipment and running the J frame, winches and cranes. Sometimes we are working with the equipment for forty-five minutes at a time. The deckhands, while very serious about safety, keep us laughing the entire time. As I am finishing this entry, we are heading towards home. It will be nice to be on land again, but I will also miss the many different personalities I was lucky enough to get to know. 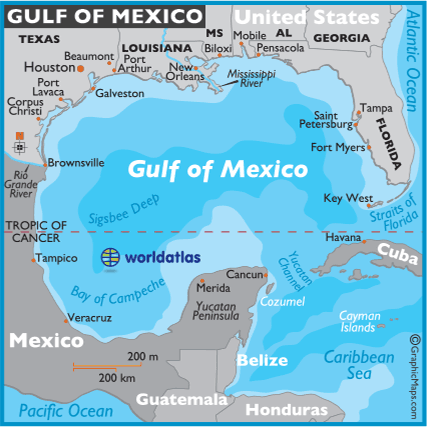 The Gulf of Mexico covers an area that is about 615,000 square miles. An area named “Sigsbee Deep” is located in the southwestern part of the Gulf. It is more than 300 miles long and more than 14,383 feet deep at its deepest point. It is often referred to as the “Grand Canyon under the sea”. 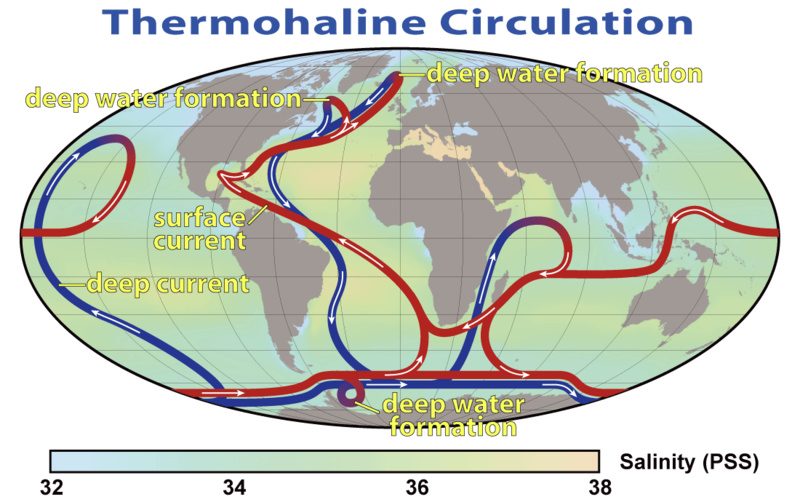 The Sigsbee Deep is the darker blue area in the Gulf of Mexico. The Gulf’s coastal wetlands cover over five million acres, which is an area equal to about one-half of the area of the U.S. It is the home to twenty-four endangered and threatened species and critical habitats. It is estimated that 50% of the Gulf’s inland and coastal wetlands have been lost and that up to 80% of the Gulf’s sea grasses have been lost in some areas. The continual loss of wetlands (about a football field a year) around the Mississippi Delta, a large land area near where the Mississippi River flows into the Gulf of Mexico, changes how hurricanes impact the coast of the Gulf. With fewer wetlands to absorb the impact of the hurricane, the hurricanes hit the populated areas with much greater force. 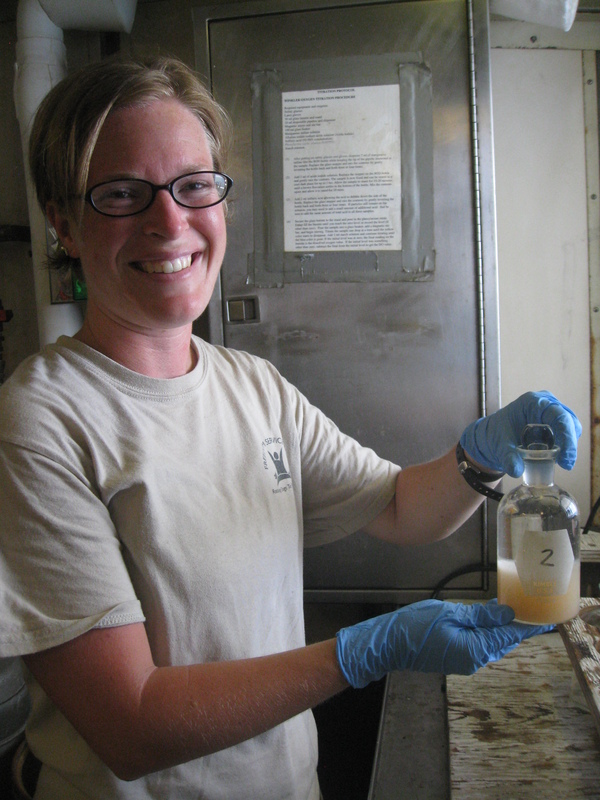 Here I’m filling up the BOD jar with our salt water samples from the CTD cast. Reminiscent of my days in high school chemistry, today I had the opportunity to work with our Chief Scientist, Brittany, on completing the daily titration. If you remember, getting readings on the dissolved oxygen in the water is an important part of this survey as we locate any hypoxic (less than 2 mg of oxygen per liter of water) zones or anoxic (no oxygen) zones. This is done with a computerized device on the CTD, but we want to make sure that our readings are accurate. Because “chemistry never lies”, this is how we ensure our readings are accurate. 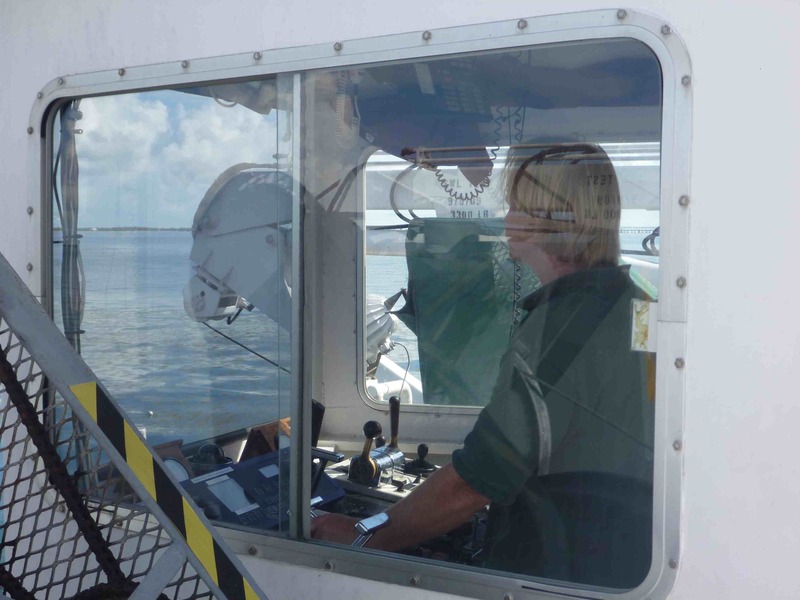 With our CTD, we have the ability to collect water samples at various depths. 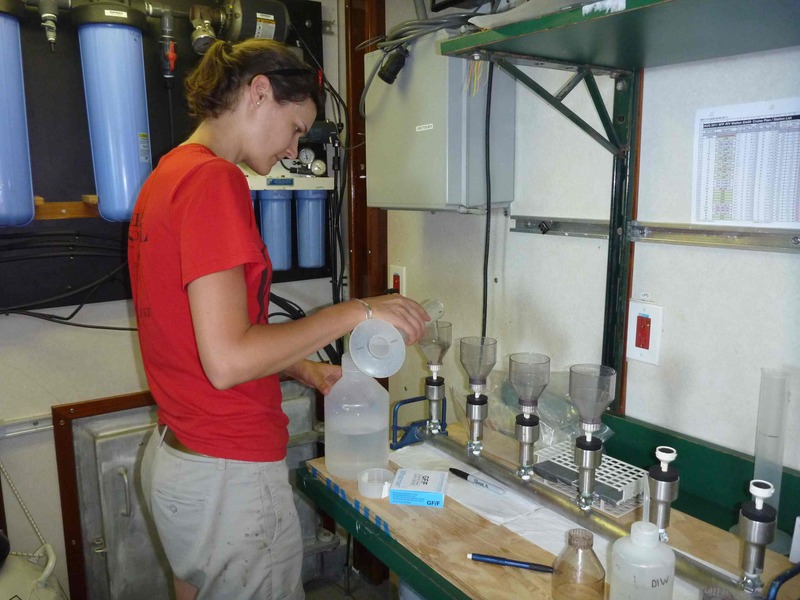 We do not collect water samples at every CTD, but rather one or two a day during the daytime hours. 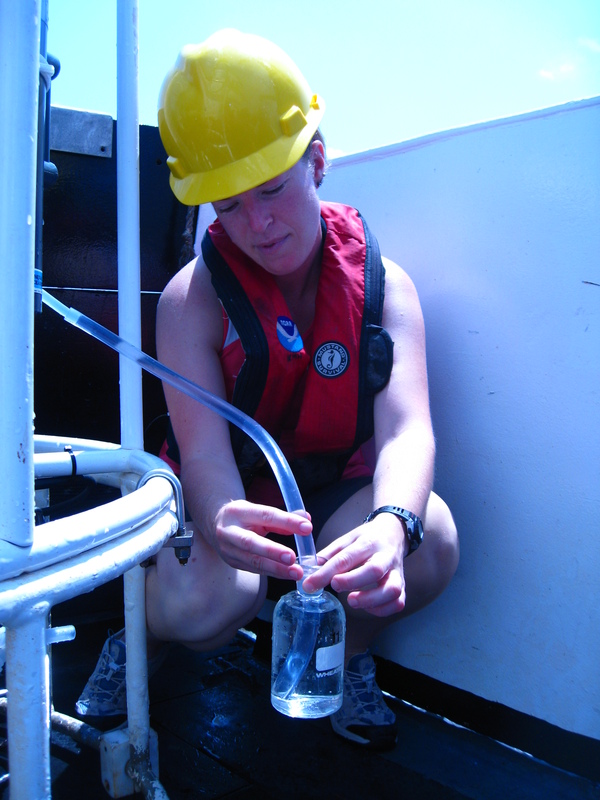 We collect water from the bottom to see if there is any expansion of hypoxia. Using the Orion dissolved oxygen meter to measure the amount of dissolved oxygen in our sample. 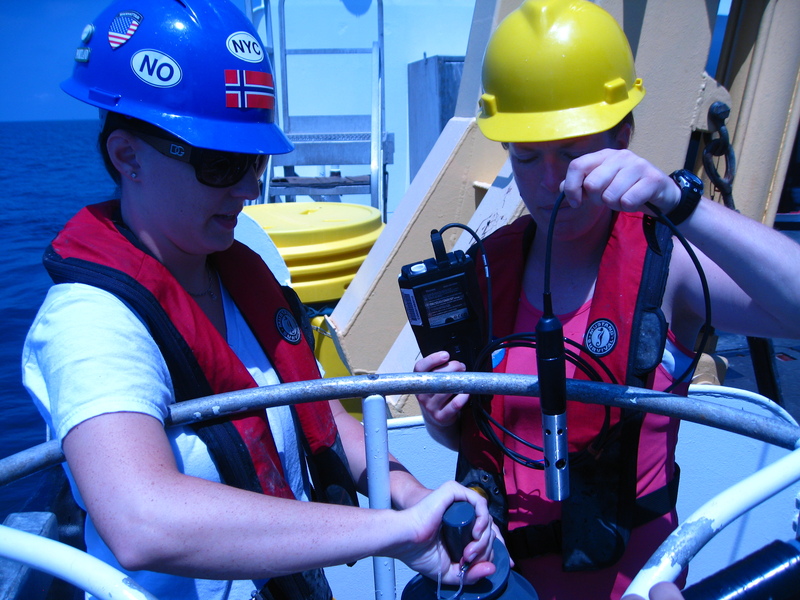 When the CTD comes back up, we use an Orion dissolved oxygen meter, which is a handheld device, to get a dissolved oxygen reading from our samples. 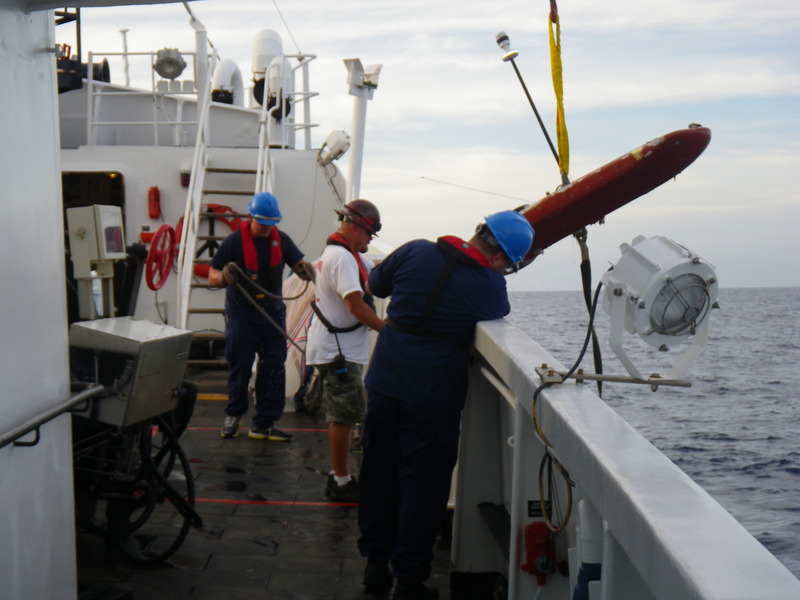 We put the probe on the end of the meter gently into the containers of water on the CTD to get our reading. We will use this number in conjunction with the information sent from the CTD to our dry lab to check against our titration results. Once we have the reading with the probe, we are ready to take some samples for our titration. 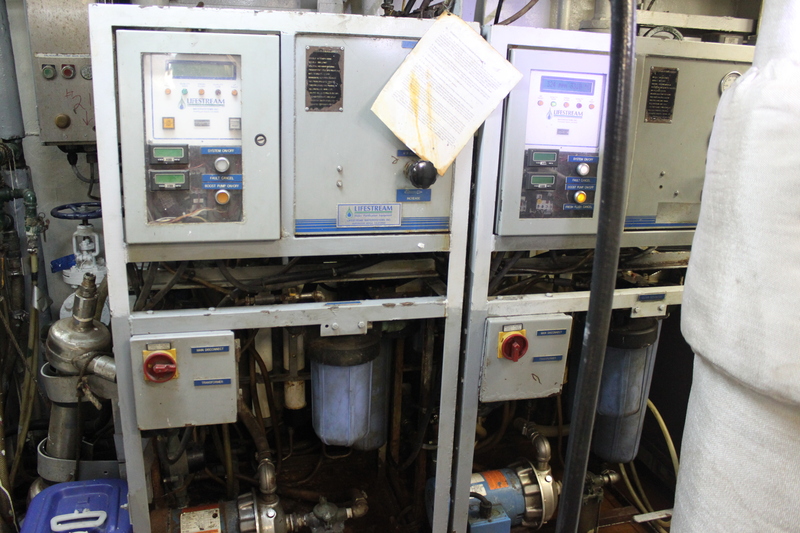 We then take the water samples in the cylinders, rinse out our 300 mL BOD (biological oxygen demand) glass bottles a few times with that water, and then fill the botttles up with the sea water from the bottom. These samples are brought back to our Chem Lab (short for chemistry, as I’m sure you figured out) where we will test the amount of dissolved oxygen. Adding the manganese sulfate to our sample. This is after I’ve added the manganese sulfate and iodide. Now we have to wait for it to settle. We are using the Winkler method to find the amount of dissolved oxygen in our water samples. 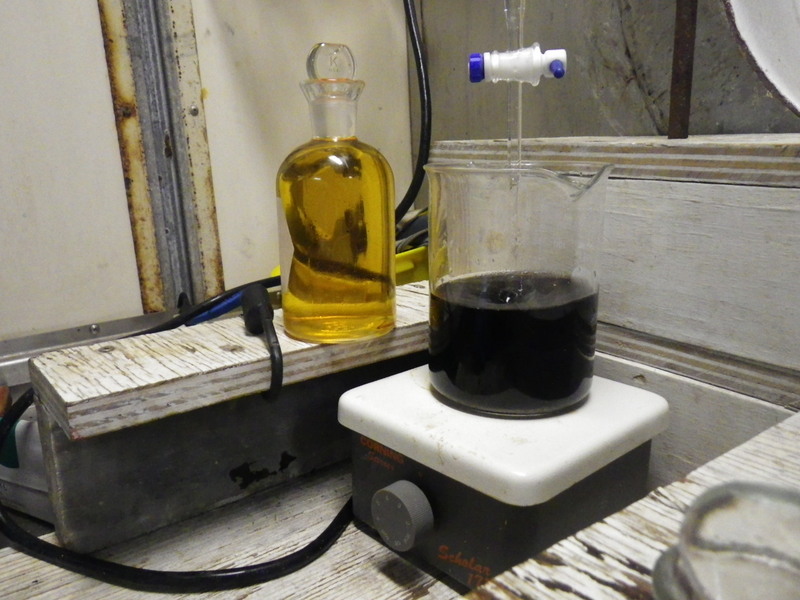 The first step in this process is to put 2mL of manganese sulfate into the bottle. After that, we also add 2 mL of azide- iodide. With those 2 chemicals added, we carefully replace the stopper and give the bottle a good shake. We then can wait about 10-15 minutes for the chemicals to settle at the bottom. Pipettes are used to add the liquids and allow us to be very precise in our measurements. Here is our sample after it has settled. After the particles have settled at the bottom, we add 2 mL of sulfuric acid (which can be a dangerous chemical if used inappropriately), replace the stopper, and shake the bottle again gently. The sulfuric acid “fixes” the solution. Finally we add 2 mL of starch to the solution, which is a blue indicator when we put it in but turns the solution a burnt orange color. Now we are ready to titrate! Our sample solution being poured into the beaker, ready for the titration. Inside the beaker is a magnetic stirrer. 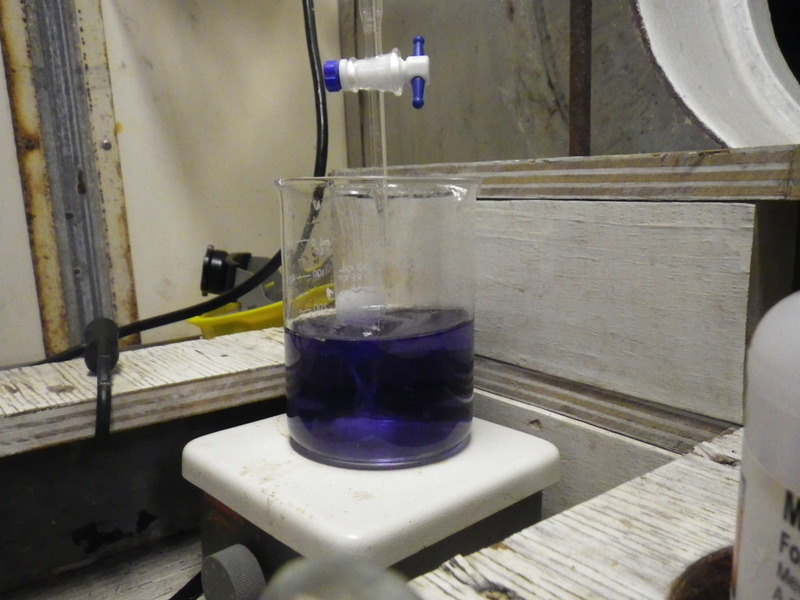 Now you can see the solution is clear in color, meaning our titration is finished. We are ready to determine the amount of dissolved oxygen. Prepared beforehand was a burette filled with phenylarsine oxide, what we use to drip into the sample. We pour the sample into a beaker and place it on a magnetic plate. We’ve placed a magnetic stirrer in the beaker so it gently stirs the solution while we are titrating. 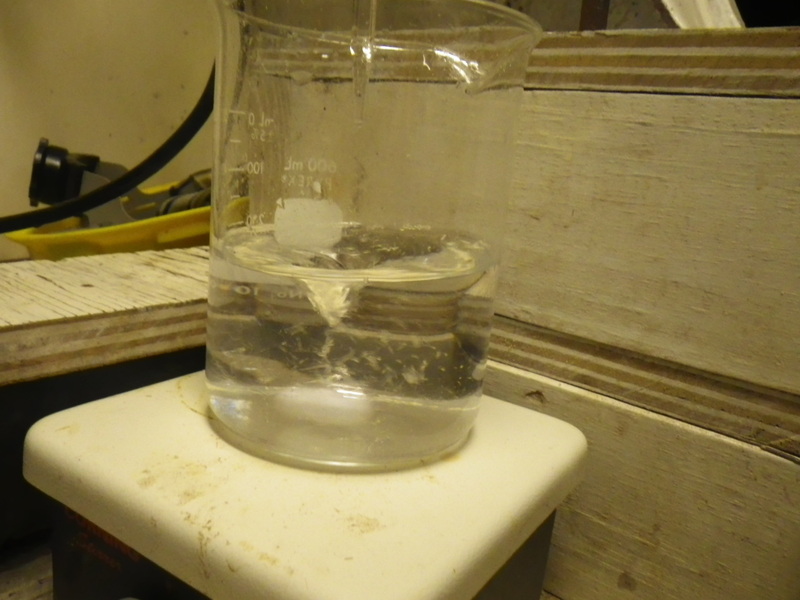 We let the phenylarsine oxide slowly drip into the sample until it turns clear. 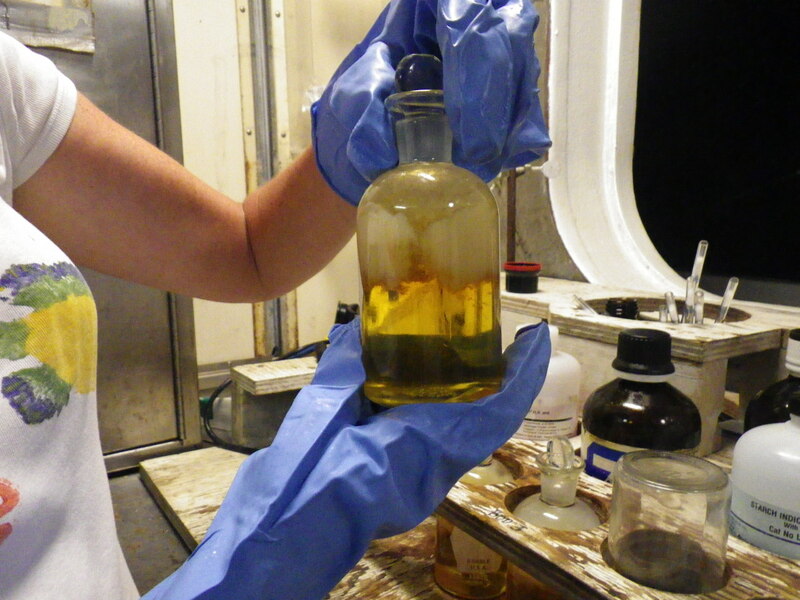 When it does this, we note the amount of phenylarsine oxide that we put in the sample (which is equivalent to the amount of oxygen in the water), and the number should match (or be very close) to the reading of dissolved oxygen that we received from the CTD and the Orion dissolved oxygen meter. 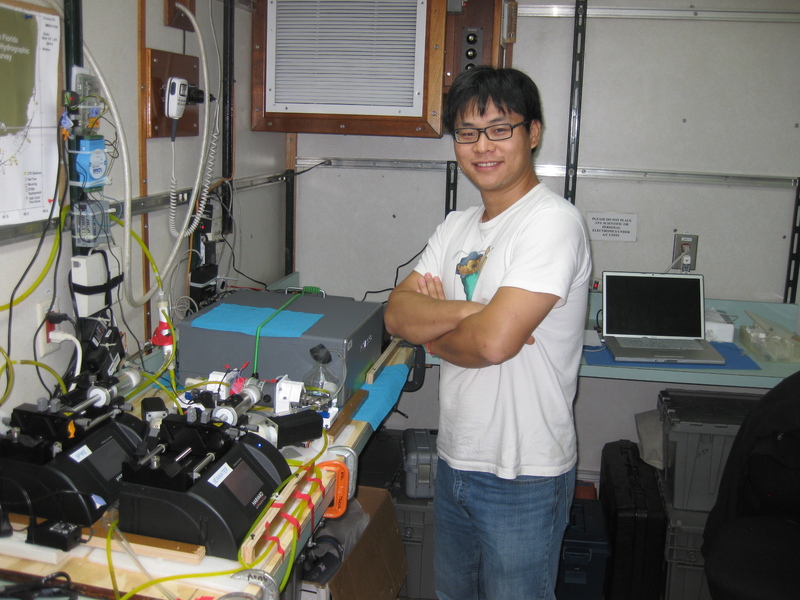 This process is quite simple yet yields important results and is just one of the ways scientists verify their data. One other interesting thing happened the other night on one of our shifts. We had brought in a bongo tow and were looking into the codends to see what we got. When Alex began rinsing the sample with some salt water, the whole codend began to illuminate. Why did it illuminate? Bioluminescence. Bioluminescence is essentially a chemical reaction that produces light. Many marine critters can produce bioluminescence, as seen below. Bioluminescence in our bongo tow. One of the things I’ve probably enjoyed the most about my trip so far are the relationships I’ve formed with the people on board. As a teacher, one of my top priorities is to build and maintain relationships with my students, both past and present. That became a bit more of a challenge to me this past year as I took on a new position and began teaching 600 students rather than the 30 I was used to. Our watch leader, Alonzo, waiting to weigh our next catch. I’ve come to love working with the scientists on the night watch, as each of them brings something to the table. Our watch leader, Alonzo, has a wealth of knowledge that he gladly shares with each of us, pushing us to learn more and find the answer for ourselves. 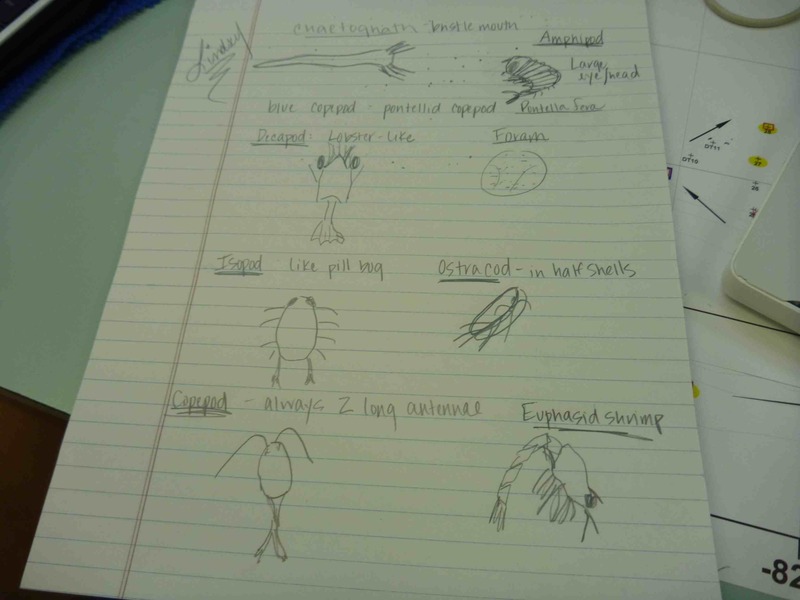 I’ve improved immensely on identifying the different fish, crabs and shrimp we find (thanks to Lindsey, who is my partner in crime for making up silly ways to remember these crazy Latin names for all our species). Where I came in knowing names of very few if any types of Gulf critters, I can now confidently identify 15-20 different species. I’m learning more about how to look for the subtle differences between different species, and Alonzo has been able to sit back and be that “guide on the side” while we work and input all of our data. His patient demeanor has allowed all of us to become more self-sufficient and to become more confident in the knowledge we have gained thus far on this trip. Alex, another one of the scientists on my watch, shows an endless enthusiasm for marine science. He shares in my excitement when a trawl comes up, and the both of us rush out there to watch the net come up, often guessing how big we think the catch is going to be. Will it fill one basket? Two? Six? It’s even more exciting when we get inside and lay it out on the conveyor belt and can really examine everything carefully. His wish finally came true today as we are now in the eastern part of the Gulf. 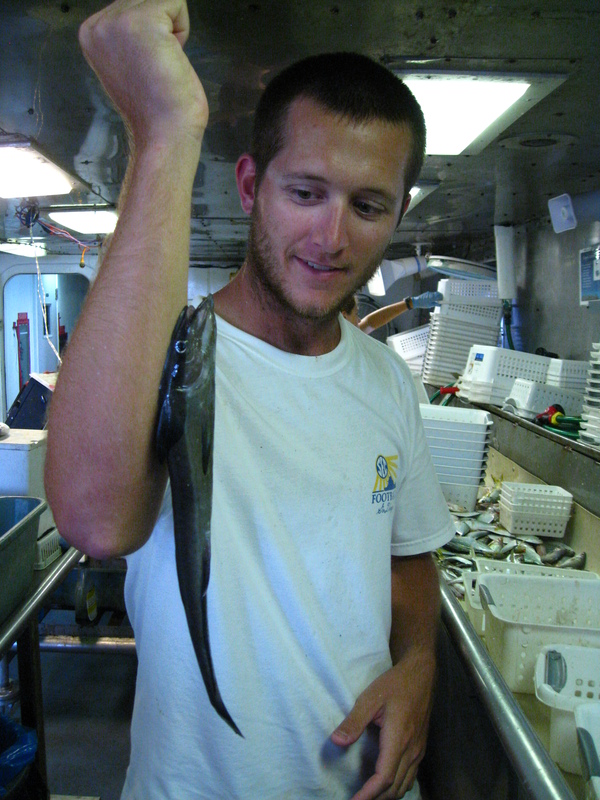 Alex is studying lionfish (Pterois volitans) for his research, and of course has been hoping to catch some. Today we caught 4, along with a multitude of other unique critters that we have not seen yet. Alex’s enthusiasm and passion for science is something I hope my students can find, whether it be in marine science, biology, or meteorology- whatever it is they love is what I hope they pursue. Lindsey and Alex, getting ready to work. 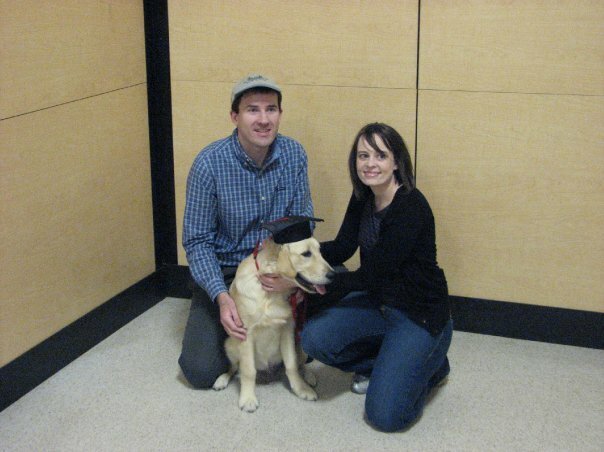 Lindsey and Renee are both graduate students. Rene wanted to gain some experience and came on the ship as a volunteer. What a better way to get a hands-on experience! 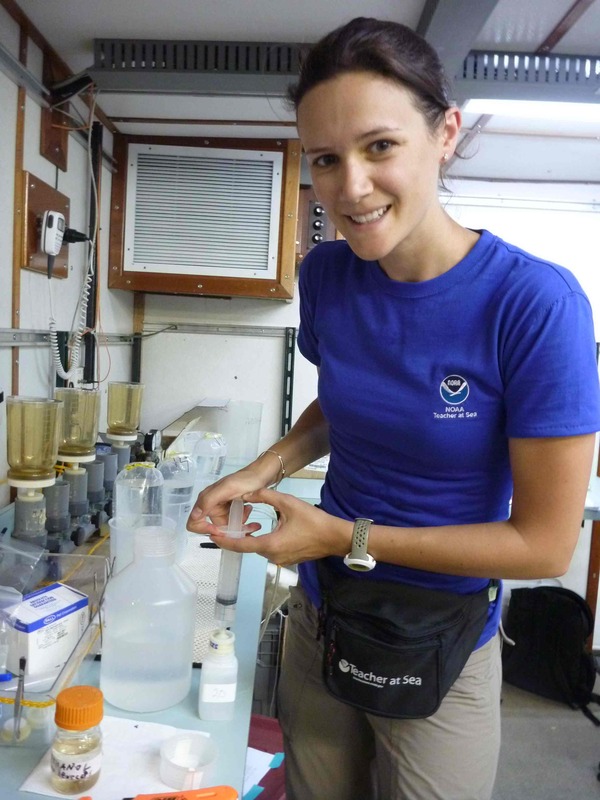 Lindsey has joined us on this cruise because she is doing research on Sargassum communities. 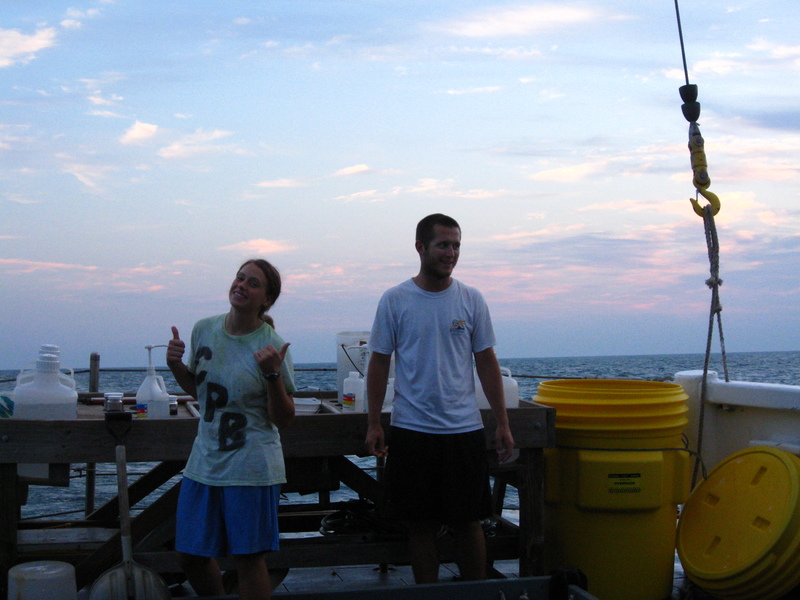 She has been able to collect quite a few Sargassum samples to include in her research for her thesis. Lindsey, like Alex, is very passionate and excited about what she does. I’ve never seen someone more excited to pull up a net full of Sargassum (which I’m sure you remember is a type of seaweed) in order to sift through and find critters. 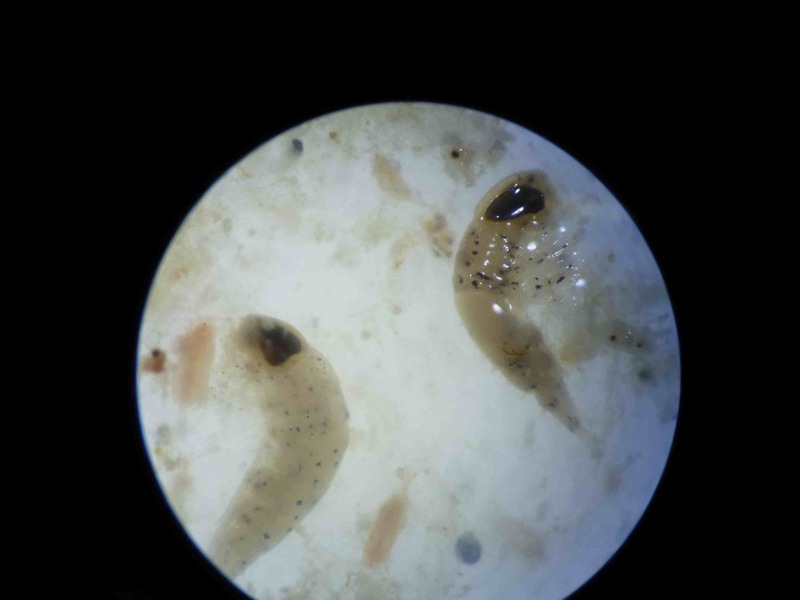 She has a great eye, though, because she always manages to find even the tiniest of critters in her samples. Just yesterday she found a baby seahorse that couldn’t have been more than a few millimeters long! Outside I hear her giggle with glee- I know this is because she has found a Sargassum fish, which is her all-time favorite. 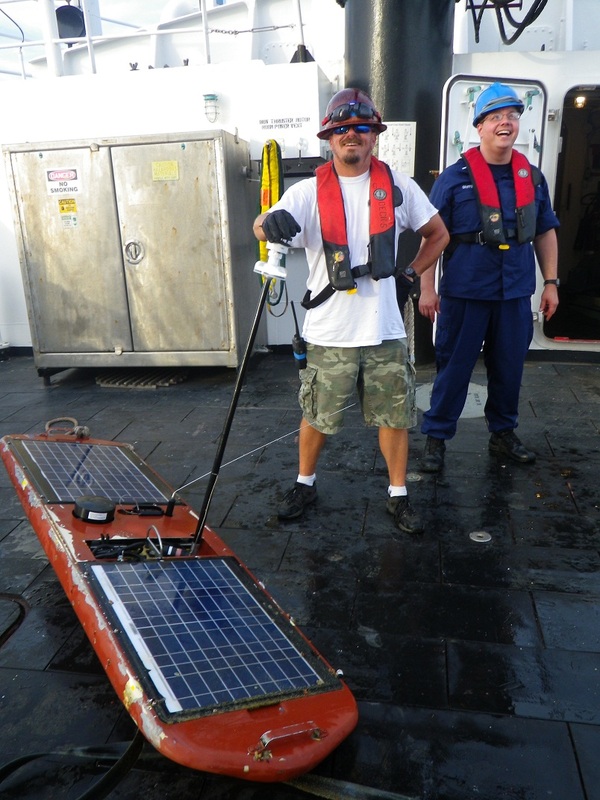 Our night watch would not be complete without the deck crew, Tim, Reggie and Chuck, who are responsible for helping us lower the CTD, Neuston and bongo tows, and for the trawl net. Our work could not be done without them. William, one of our engineers, took me down into the engine room the other day. First impressions- it was hot and noisy! It was neat to see all the different machines. 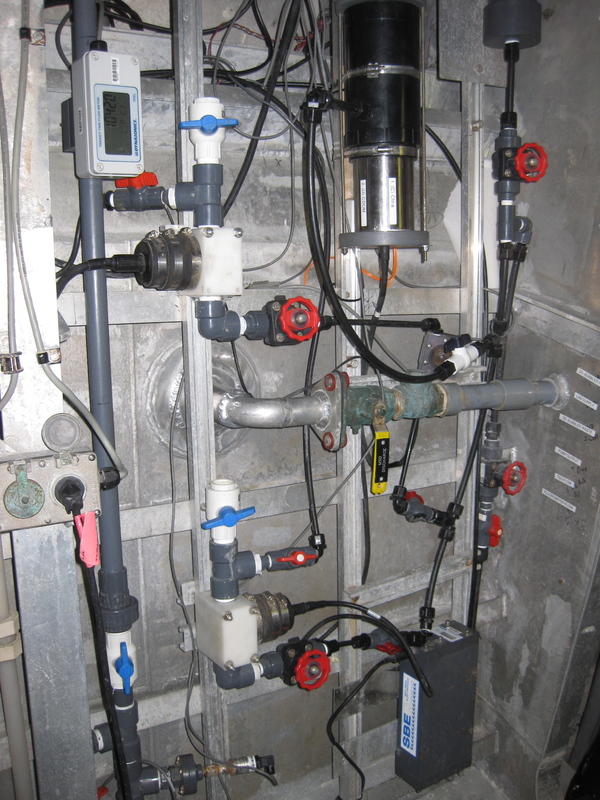 The ship makes its own water using a reverse osmosis system, which takes water from the ocean and converts it into drinking water for us (this water is also used for showers and sinks on board). One interesting note is that the toilets actually use salt water rather than fresh water so that we conserve our fresh water. I cannot believe how fast this leg has gone and that we only have a few more shifts to go before we return to the Oregon II’s home port of Pascagoula. As we’ve moved into the eastern waters of the Gulf, we have seen a lot of different types of critters. On average, our most recent trawls have been much more brightly colored. We are near some coral reefs too- in our trawls we have pulled up a bit of coral and sponge. The markings on some of the fish are very intriguing, and even fish we’ve seen before seem to be just a little brighter in color out here. 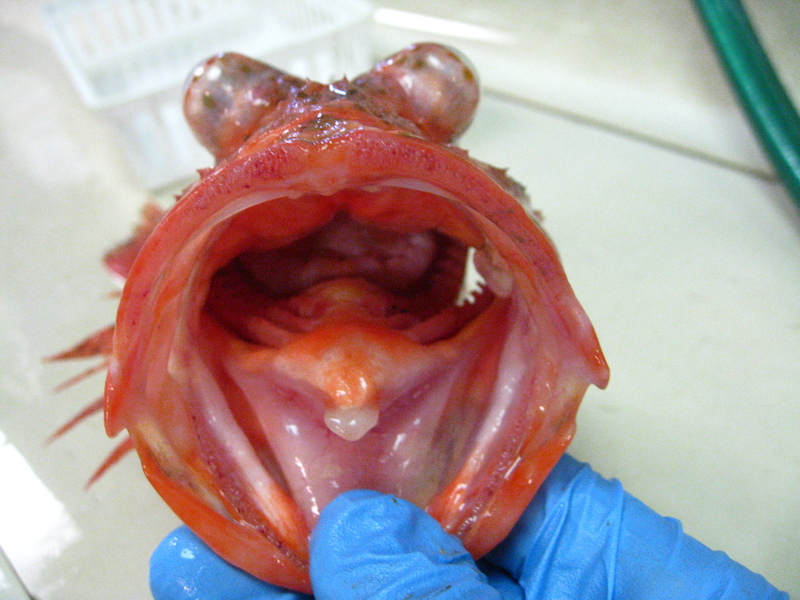 The mouth of a scorpion fish. We’ve caught a bunch of these since we hit the eastern Gulf. 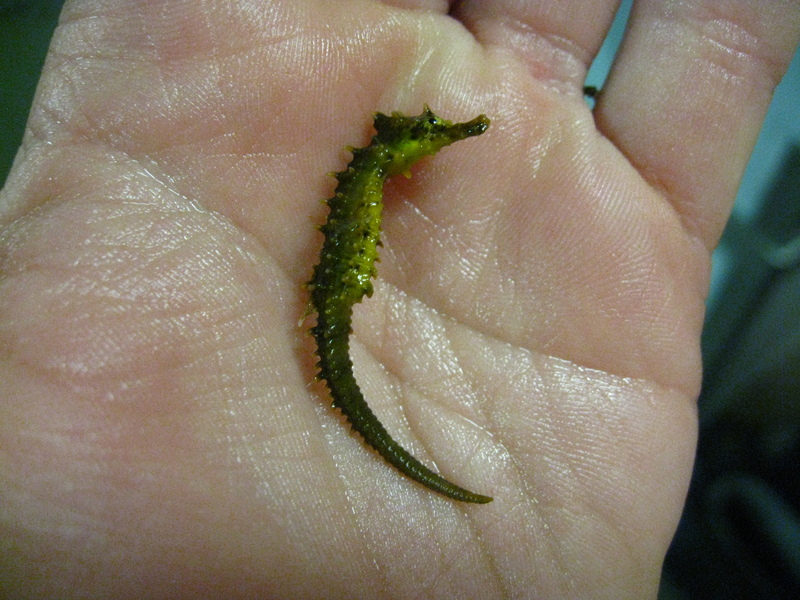 A baby seahorse we pulled out of our Neuston tow. He was hiding in the Sargassum. 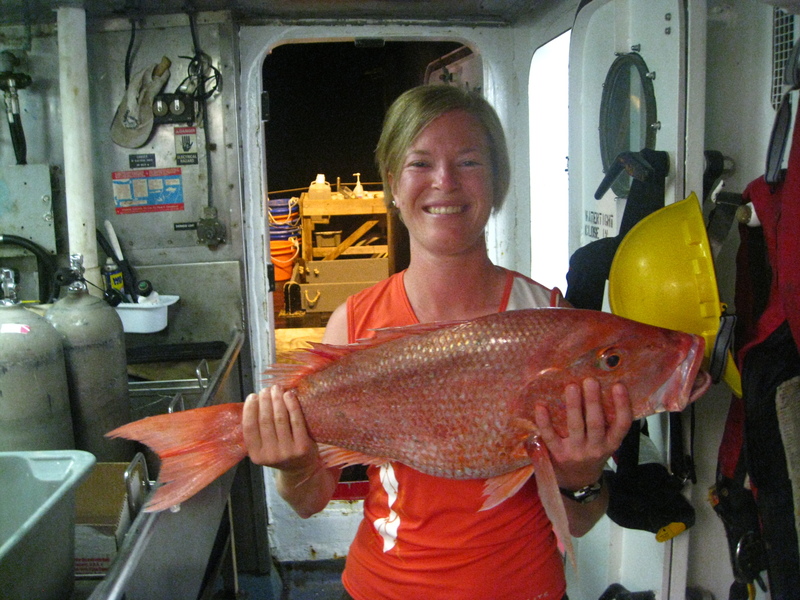 One of our biggest red snappers. 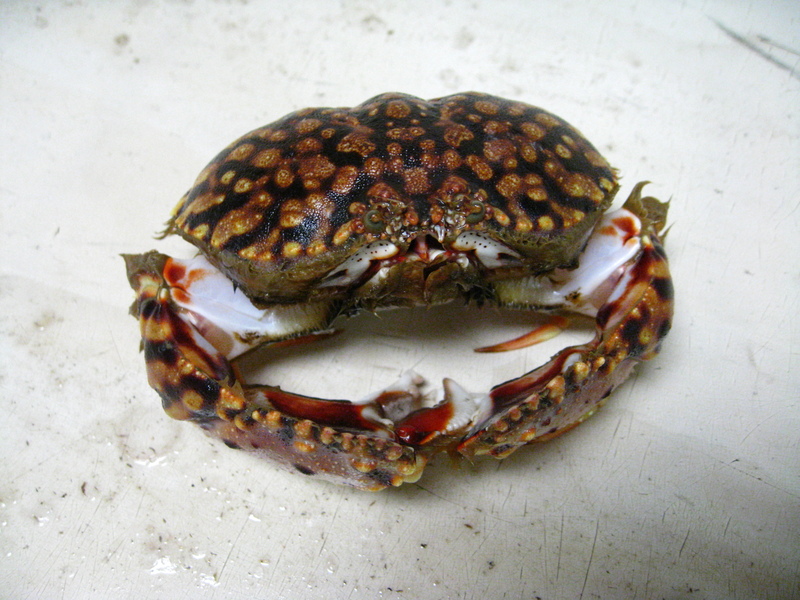 This is another type of bashful crab, also known as the flame-streaked box crab (Calappa flammea). 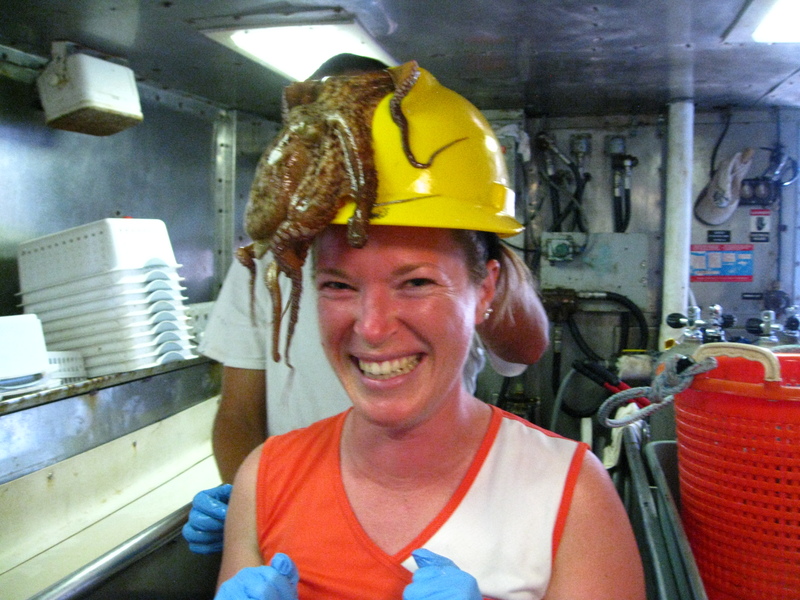 This octopus sure liked my hard hat! 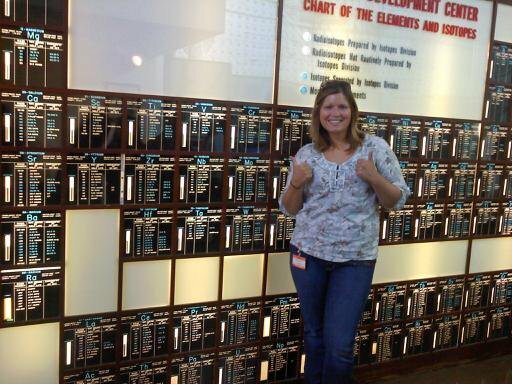 That’s me and one of my loves: the periodic table! My first post is supposed to be an introduction to me and what I’ll be doing for three weeks in the middle of the Bering Sea so here goes nothing! My name is Amanda Peretich, and I have been teaching biology, chemistry, and criminal science investigations (get it? CSI) at Karns High School in Knoxville, TN for the past four years. My route to teaching high school was probably not really traditional, but it’s provided me with plenty of adventures along the way, and if you know me, you know I love a good adventure! I am so excited to arrive on the NOAA ship Oscar Dyson to participate in walleye pollock research in an acoustic trawl survey in the eastern Bering Sea (similar to this one from last summer) in a little over a week. You’ll hear plenty more about this research in the weeks to come. How am I able to do this? 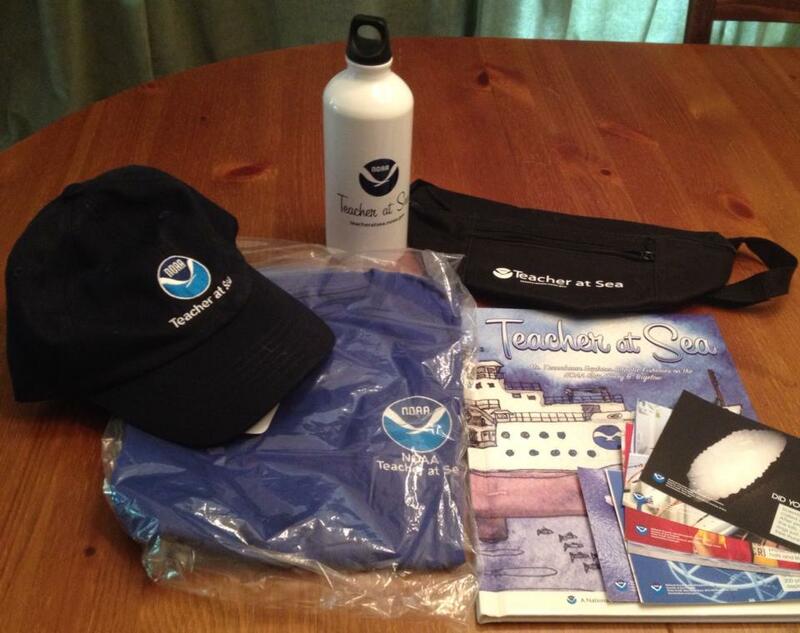 Well, NOAA (which is an acronym for National Oceanic and Atmospheric Administration) has a Teacher at Sea program that I had never heard of before last fall when I randomly found it in a Google search for summer teacher-y programs. Ahh, the wonders of the internet and technology! So I applied to the program (really kind of at the last-minute, which also hits on my procrastination problems), wrote some pretty good essays, had some amazing recommendations from people (shout out to Theresa Nixon and Anne Hudnall for what I can only imagine were the best letters ever! ), and later found out I’d been selected as one of 25 teachers from across the U.S. for this amazing opportunity! FUN FACT: Did you know that the Discovery show Deadliest Catch is filmed in the Bering Sea and that the operations base for the fishing fleet is in Dutch Harbor, Alaska where I will be leaving from? However, I think those rough seas on the show are due to filming during the fall and winter seasons, not summer. I’m sure I will update you in a later post about how crazy the waters are during July, but I will have to remember that it could be much more treacherous. Did I forget to mention that this experience is also the beginning of a new chapter in my life? My wonderful husband Michael finished his PhD in chemistry at the University of Tennessee and accepted a civilian chemist position in the fuels lab with NAVAIR in Patuxent River, Maryland. I finished out the school year and sold our house in Knoxville while he has been training and traveling to fun places like Pensacola, Florida, but I will officially move up to Maryland the day before I get on a plane for Alaska! Didn’t I say how much I love adventures and the unknown?